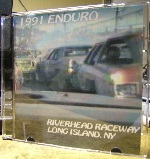 The DVD is 45 minutes of racing from Long Island, New York's RIVERHEAD RACEWAY. crumple, and the chains rattle. An Enduro is a 100 lap race with only 4 rules.